The New US President: Jobs, Wages, Health & Social Security: What's Next? More from the Economists for Peace and Security conference. The macro panel, with Josh Bivens, Nancy Altman, Pavlina Tcherneva, and Stephanie Kelton. EPS Symposium: Policy Challenges for the New US President: Jobs, Wages, Health & Social Security: What's Next? from Thea Harvey. EPS Symposium: Policy Challenges for the New US President: Global Security: Russia, China, Europe and Latin America from Thea Harvey on Vimeo. THE CLOSING DATE FOR THE CROWDFUNDING CAMPAIGN FOR THE JMK WRITINGS PROJECT. I thank, from the bottom of my heart, all those who have backed the campaign, with donations ranging from USD5 to USD1,000. Almost everyone has said complimentary things about the proposed edition (‘great idea’, ‘wonderful project’, ‘best of luck’ etc), but far fewer have followed up with contributions. The bottom line is this. Funds are essential if the edition is to be realized. The people undertaking the large and necessary tasks of word-processing documents and background research need to be paid. All the money raised by crowdfunding will be devoted to document preparation, not to travel for document collection. It is now time for the many supporters of the project to get serious about whether they want also to be backers and so help make the edition a reality. Time is running out − only about 3 weeks remain before the crowdfunding campaign ends. Recent events have made understanding Keynes’s economics, politics and philosophy even more important. This link also gives more information about the project, the campaign and the editor. Remember the overall aim: to benefit the world by completing the publication of all of Keynes’s writings of academic significance, only about one third of which are presently available. THANK YOU IN ADVANCE FOR YOUR BACKING OF THE JMK WRITINGS PROJECT. Professor Rod O’Donnell, University of Technology Sydney, Australia. Secretary Clinton, you are rightly being blamed for the electoral tragedy that has befallen our country. The country wanted change and you offered continuity. You prided yourself on the neoliberal economic policies of your husband, President Bill Clinton, which have driven our country into stagnation and despair. Your rejection in Wisconsin, Ohio, Michigan, and Pennsylvania speaks to a greater rejection of the economic policies you, your husband, and your Third Way associates imposed on the party of Franklin Roosevelt. President Obama, you too deserve enormous blame. You wasted the historic opportunity at the beginning of your presidency to break with neoliberal economics. Instead, you pushed Obamacare with its expensive sub-standard insurance that is punitively imposed on the self-employed. Donald Trump benefited enormously from the premium increase notices that were received up and down the country in the week before the election. And at the end, you pushed the Trans-Pacific Partnership, another neoliberal globalization agreement, which ceded the economic argument to Mr. Trump. Your charm and intelligence are no substitute for the economic change we need, you promised, and then reneged on. Cromwell’s words apply to both of you. Heed them and be gone. Economists for Peace and Security will conduct its 9th annual policy symposium at the Hyatt Regency Capitol Hill in Washington DC today to discuss the economic dimensions of the most pressing global security issues and those facing the domestic economy. Following one of the most unusual presidential and congressional elections in US history, panelists will present ideas for improving prospects for peace, and growth with fairness for all Americans. Program starts at 9am. Watch the livestream here. Upton Sinclair famously said that "it is difficult to get a man to understand something, when his salary depends on his not understanding it." Not understanding the results of this election is what the Democratic establishment is trying very hard to do. Many will continues to say that at the heart of the loss are the misogyny, racism and xenophobia of Trump and his supporters, which is real and problematic, but deny the truth that it was the neoliberal free trade policies pushed by the Clintons and Obama that kept people from going to the pools, in particular in the Rust Belt (see here, but also here, which says essentially the same). Hillary had slightly more votes than Trump (and yes the electoral college doesn't help, but that's not the problem now), but she had less votes than Romney and about 8 million less votes than Obama in 2008 (when some people thought he was a progressive; btw, there was back then a thing called Economists for Edwards, since many progressives thought, correctly, that Obama was a centrist like the Clintons. He ended up receiving a lot of support because he was the anti-Clinton candidate). Of course you will hear a lot about how we need serious people to take over the party in these difficult times, and how we need to collaborate with President Trump, and not be obstructionist, and the idea of electability (how did that work with Hillary?) will be brought back in four years. The emblem of that were the comments from Daron Acemoglu that I quoted the other day: "as long as the Democratic Party shakes off its hard-core anti-market, pro-union stance, there is a huge constituency of well-educated, socially conscious Americans that will join in." That position cost Dems the election, but you should not be surprised that this is taken seriously. This is what the party's establishment is trying to do, since their jobs depend on them not understanding that the Dems need the working class, and they do prefer the nice and educated people in their cocktail parties anyway, rather than the uncouth, and in their view, racist, misogynistic, and xenophobic,* blue collar workers. * Before some idiot suggest that I'm saying no Trump supporter is racist, misogynistic, and xenophobic, yes there are too many indeed, and his presidency will make things worse. But that's not the reason the election was lost, and many of his voters are NOT those things and DO have legitimate economic grievances. 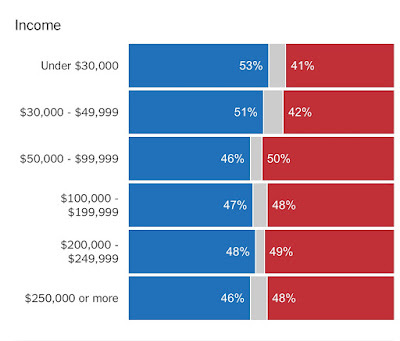 And yes, the majority of the working poor actually voted for her (not enough in the Rust Belt), as I noted in my previous post on the election. In light of increased unemployment, the absence of strong economic growth and the threat of deflation in many countries, the recent financial crisis led many to expect a shift in monetary policy. Central banks were at the forefront of these changes, by shunning ‘conventional’ policies in favor of so-called unconventional ones. After experimenting with Quantitative Easing, a number of countries have recently officially adopted negative interest rates in the hope of reviving their moribund economies. Today, the Swiss National Bank, the Bank of Japan, the Bank of Sweden and others, have all gone negative. However, nearly two years after Switzerland adopted the policy in January 2015, there are questions regarding its success, and overall consequences on economic activity. At the empirical level, negative rates did not increase bank lending and has even generated unexpected and perverse effects. At the theoretical level, questions remain regarding the neoclassical/money multiplier model upon which such policies are based. Finally, on the epistemological level, many questions arise: what monetary policy? What should be its objectives, means, and instruments? What are the challenges that monetary policy must now face? At the heart of this policy debate is the insistence of using monetary policy to stimulate growth, as opposed to the use of fiscal policy. It begs the question of whether monetary policy is still the most relevant policy to use in periods of slow economic growth, or secular stagnation-type conditions. This special issue aims to make a major scientific contribution to the conduct of monetary policies of negative interest rates. Proposals can be very diverse in nature (empirical, theoretical, and epistemological) and from various theoretical backgrounds. The purpose is to encourage discussion on a very important policy question. The issue will be co-edited by Louis-Philippe Rochon and Guillaume Vallet. Please note the following deadlines: deadline for submitting an abstract: February 1, 2017; deadline for submitting the final paper is September 1, 2017. There will be a lot to say about the election from all kinds of pundits. On the left, many will blame the coverage of emailgate, Comey, the FBI, third party candidates, Bernie and Bernie bros, racism, xenophobia, misogyny, the electoral college and God knows what else. And certainly all of these things did play a role. But it was minor. The election was lost in the old Rust Belt, the decadent manufacturing center that has been hit hard by trade deals (as discussed here, really most of the decline happened after the entry of China in the WTO). Hillary lost Indiana (a given), Michigan (surprise again), Ohio (also not a surprise), Pennsylvania (a yuge surprise to me), and Wisconsin (another surprise). The blue wall that pollsters suggested almost guaranteed her victory was not there (more on that below). And yes, as noted here, areas hit hard by the effects of trade with China went for Trump. Note that this is not the same as saying that working class voters went for Trump, an argument more akin to Thomas Frank's What is the Matter with Kansas. 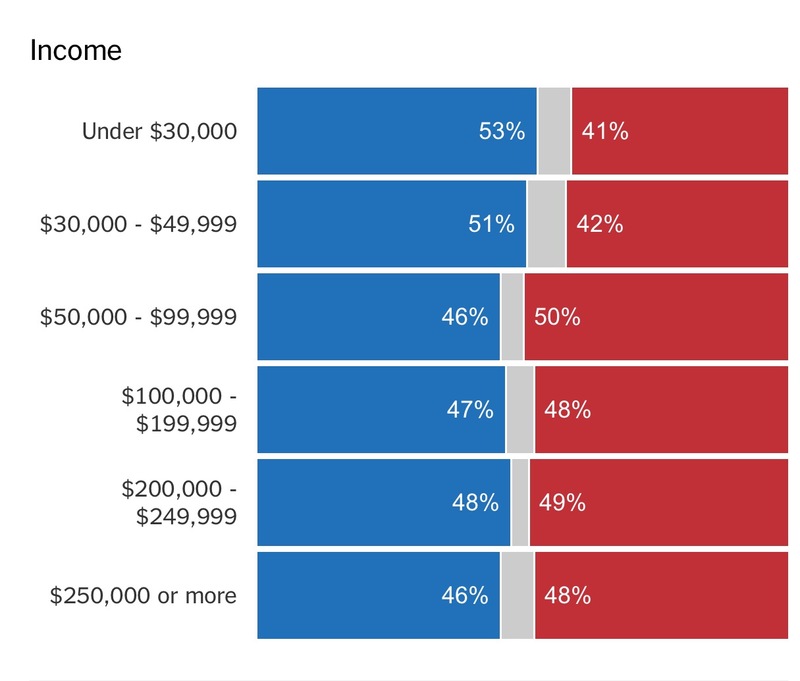 As shown below, people with the lowest levels of income voted for Hillary. And in the higher levels of income Trump got a small edge. So people know that he is not one of them, and will not really work for the poor. The cleaning crew of the Vegas casinos didn't vote for Trump. But the working class in the areas affected by trade did, 'bigly.' As I noted in my posts on the election (here on his victory in the first debate, here on the need for a progressive ticket partner from the Rust Belt and here on the neglect of unions), trade matters, and he was more credible than her on trade issues (and that's why Bernie was a better candidate than her; btw, whether he would have won, of course, is mere speculation now). I should add that I don't think we are in for a recession, at least not because a Trump administration would promote austerity. In fact, as discussed here, Republicans tend to increase spending and cut taxes, with regressive distributive impact, but if one believes in the 'new view' of fiscal policy (i.e. 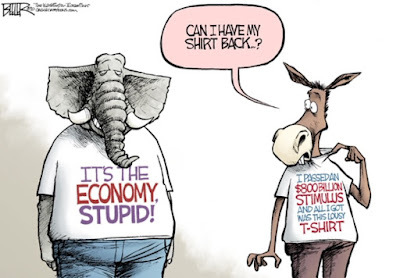 the old Keynesian idea that fiscal policy works), then he might actually preside over the acceleration of growth and the end of secular stagnation (I'm not that confident, but just saying). In fact, forget any discussion of government shutdown, and debt ceiling for the next four years. The size of debt and deficits will only be invoked to cut social spending, on health, education, welfare and for promoting the privatization of Social Security. 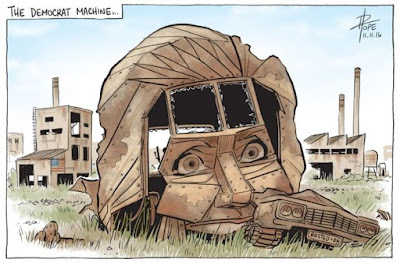 Some sort of military Keynesianism is not out of question. And that should scare the left, since he can built a coalition that includes Christian fundamentalists (even the Mormon ended up voting for him, btw), the white working class in the Rust Belt, and the old racist right in the South. My hope is that, since his policies will not be able to bring back manufacturing to the US, and that he might produce more heat than light regarding trade (his party remains the main ally of Obama on TPP), that this might not take place. Also, I think there will be a lot of effort to try to disguise the true economic causes of the loss. The fact that for many the last three decades have not been good, and that they feel abandoned by the Dems, and particular their neoliberal wing led by the Clintons. This is not the end of the neoliberal side of the Democratic Party. It will take a long fight to bring them down (see the problems of Corbyn with the Blairites within Labour; on Brexit which has similarities with the current situation in the US go here). One last thing, I should add that against my best instincts (as my son who remained very skeptical of pollsters and somewhat sure Trump would win scolded me later), and even though, if you check the posts above, I kept saying it was going to be closer than necessary, I sort of accepted that polls were more or less right. He could outperform in some states, but not in that many to win. This says something about the quality of polling (see this). Cell phones and the overwhelming increase of inane telemarketing calls has reduced the accuracy of political polling. I also think that this vindicates (even though he also got it wrong) Nate SIlver's methodology of weighing polls by their historical track record. 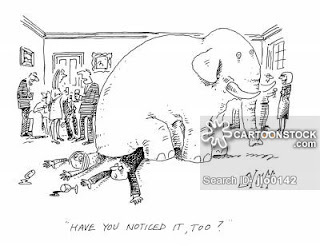 PS: By the way, in the last seven elections Republicans won the popular vote only once (2004). But Dems only won in four elections (1992, 1996, 2008, and 2012). That also suggests that the Republican coalition has limits, associated to demographic changes. But Dems still need the white working class in the old Rust Belt. Keynes had a profound influence on Prebisch in terms of the diagnosis about the main failures of market economies and the need to pursue pro-active and anti-cyclical policies. However, Prebisch was critical of some aspects of Keynes’s General Theory of Employment, Interest and Money, in particular on the theory of interest and the multiplier. His attitude can be explained by a difference in the object and method of analysis. Prebisch’s interests focussed on dynamics and the cycle, themes that were peripheral to Keynes’s central message. Prebisch’s Keynesian influence and his rejection of some aspects of Keynes’s magnum opus explains why at the same time that Prebisch is often described as the Latin American Keynes, he is portrayed as concerned mainly with the long-run development problem of Latin America and without proper consideration to demand factors as fundamental determinants of output and employment. Paper behind the wall, I'm sorry to say, here. This paper discusses the connections established in recent non–neoclassical literature between growth, structural change and income distribution in large developing economies. We argue that though many analyses have the merit of reintroducing income distribution as a factor in economic growth, they rely almost exclusively on macroeconomic theory, and thus ignore the structural changes that have taken place in recent decades and the ways in which structural aspects of an economy (such as resource availability, market size and geopolitical factors) affect policy options and growth. We argue that Latin American countries today face the same challenge that has constrained their development trajectory historically: to diversify their economic structure through new technological capabilities and greater equality and social progress. As long as the Democratic Party shakes off its hard-core anti-market, pro-union stance, there is a huge constituency of well-educated, socially conscious Americans that will join in. I don't agree with all of the CEPR proposals. I always found the free trade on professionals a peculiar idea. At any rate, that would alienate a constituency of the Democratic Party. But it is very instructive of what mainstream economists, even some considered liberal, might say, and what we should expect in case Hillary wins and brings these kind of economists as advisers to her administration (if she wins, which as I said earlier, is not guaranteed; it seems now it's going to be very close). The solutions for the poor (vulnerable is a nicer euphemism) will come from the educated elite, which is "socially conscious." So forget about Bernie and the progressive wing of the Party and just become the old GOP, an aggiornamento of the Rockefeller Republicans. And that's why, in a nutshell, many working class people are going to vote for Trump. These guys think, against logic and evidence I would add, that minimum wages are bad, that powerful corporations are fine, but strong unions hurt the economy, and that trade deals have had only positive effects. Acemoglu seems to know very little about how the actual rights of workers were obtained in this (or any other for that matter) country. Nobody gave workers their rights for free, and even FDR and Frances Perkins (his Labor Secretary), which were socially conscious members of the elite, would not have passed some of the labor legislation without the sit-down strikes, and the pressure and organization from below.